Ivor Douglas Weston Sinden was the eleven year old son of Mrs. Beatrice Minnie Sinden (nee Weston) of 22 Greenfield Road in Gillingham. Mrs. Sinden was a widow having lost her husband, George William A. Sinden in 1923. She had one surviving son. The Sinden's had lived in Gillingham since 1920. Beatrice's parents were Isaac Weston and his wife Fanny Hadlow. Both has passed away before Ivor`s death, Fanny just three years before. Beatrice passed away in 1939 in Kent. Ivor attended the Barnsole Road School. Besides being a Cadet since 1926 he was also a Boy Scout of the same troup which had lost four boys in the fire. Mrs. Sinden received a sympathetic telegram from the Chief Scout, Sir Robert Baden-Powell. Mrs. Sinden was at the fete and saw her son perish. He thew up his hands and shouted "Help, help" before he fell. Ivan's body was identified by Albert Weston, his uncle. Cecil Babington (pictured by the car on display at the unveiling ceremony) was a childhood friend and next door neighbor of Ivor Sinden who died in this tragedy at the age of eleven. The last time Cecil saw his good friend was on the morning of the 11th of July 1929 when Ivor left to attend the fete that day. Sadly, Cecil would never see his friend again. Throughout the years, Cecil never spoke of his pain and sadness of losing his friend, nor had he told his family about this tragedy. A few days before the unveiling ceremony Cecil read about the event in the local paper. Although he rarely goes out these days, he contacted his family and expressly asked them to take him along to the memorial. He only then told his family about the tragedy and his connection to it. 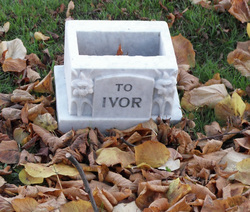 It was important to him that he attend to remember his friend Ivor. His Grandaughter Catherine Luck who brought him to the unveiling said "What happened that day still affected him more than 80 years on and we didn't even know. It was down to you Lori that he was able to pay his respects to Ivor and have some closure. Which means a lot to him and to us. Thank you Lori x"